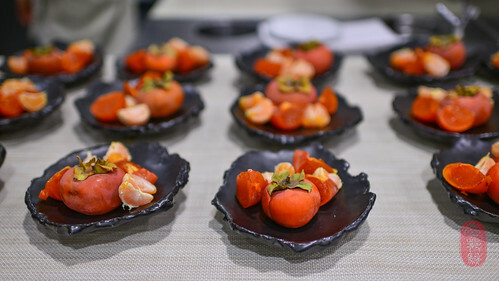 “The Feast of the Seven Fishes,” they announced at staff line-up on the second day of the Twelve Days of Christmas. And everyone’s eyes lit up. I first met Frank Castranovo and Frank Falcinelli on a crazy weekend in Spain. We were all there for the Gastronomika conference, and stole a day to venture into the wild, Basque countryside for a long, leisurely lunch at Asador Extebarri that spilled over into dinner at Mugaritz. * That initial meeting seemed to set the bar for our subsequent, chance meetings in the most far-flung and extraordinary places: Mexico City, Lyon, and this past weekend, Napa Valley, where they cooked the second dinner of this year’s Twelve Days of Christmas at the Restaurant at Meadowood with hosting chef Christopher Kostow, and with wines paired by Diamond Creek Vineyards. Castranovo and Falcinelli grew up together, and by chance, were reunited years later, when both were cooks (if you ever meet them, ask them to tell you the story). Raised by Italian-American families in Queens, both longed for a taste of their childhood. So, they opened Frankies Spuntino 457 together in the Carroll Gardens neighborhood of Brooklyn, focusing on “seasonally-inspired Italian fare” that ” [embodied] the sum of their travels, food philosophies and experiences.” Since, they’ve also opened Prime Meats, which is next door to Frankies Spuntino 457, as well as another location of Frankies Spuntino in the West Village (door number 570). [The Feast of Seven Fishes is] a Southern Italian and Italian-American celebration of Christmas Eve consisting of seven different seafood dishes. It originates from Southern Italy, specifically Naples, where it is known as The Vigil (La Vigilia). Althought it is unclear when the term “Feast of the Seven Fishes” was popularized, the Franks have been celebrating this Neapolitan tradition with their families since they were born and are excited to share this with you tonight. 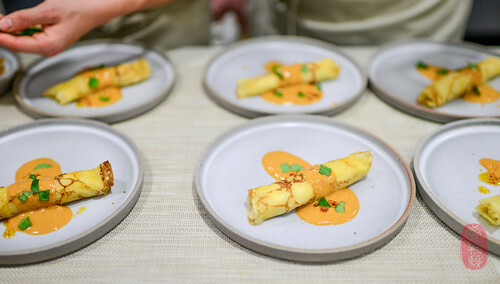 Among Kostow and the Franks, seven different fishes were served at this dinner, starting with fried smelt as a canapé, and ending with baccala Vesuviana — salt cod with a tomato-caper sauce. In between there was a comforting bowl of mussels, served with a giant “frizelle” (a toast crouton) set afloat in a rich, seafood broth, fragrant with white wine. 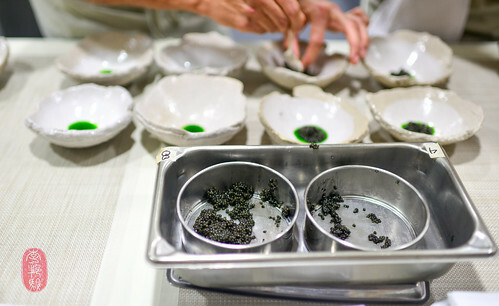 That dish, along with the gently smoked white sturgeon caviar that Kostow served under a veil of melting lardo, were my favorite courses of the night. Sturgeon is usually too steaky for me. But Kostow wrapped the fish (which he gets from Passmore Ranch) in cabbage and buried it in ash to bake, in effect steaming it. The result was a moist, tender block of sturgeon, which was served with slices of fermented pear, and a dollop of parsnip cream. Bread is a big part of Italian feasts. So the Franks ordered up loaves of sesame bread from Tartine Bakery, which they served with super smooth, first-press olive oil (under the Frankies 457 label). As if willing the guests into the familial spirit of Il Festa dei Sette Pesci, the Franks bombed the dining room with a spectacular parade of shared sweets at the end. And it worked. 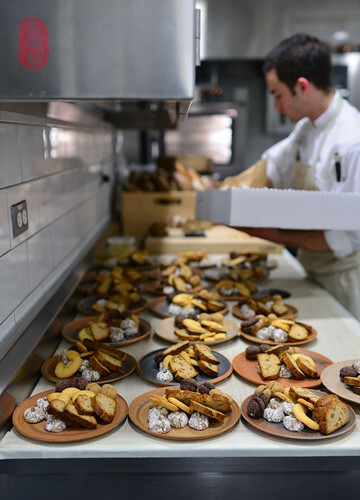 Guests lingered over a cornucopia of persimmons, dried figs, roasted chestnuts, and tangerines, as well as plates mounded with assorted biscotti provided by Tartine Bakery (my favorite were the sandy, hazelnut sablé cookie sandwiches; the anisettes were pretty great too). The Franks’ enthusiasm and thoughtfulness not only infected the dining room, but the kitchen as well. The mood of the cooks seemed especially buoyant that night. For me, the Franks’ dinner with Kostow was a wonderful expression of the holiday spirit at the Twelve Days of Christmas: generosity and conviviality, with a touch of old-timey nostalgia. It was a fun night. Below, you’ll find the menu from the second night of the Twelve Days of Christmas with Frank Castranovo and Frank Falcinelli of Frankies 457 and Prime Meats, and Diamond Creek Vineyards, as well as a slideshow of all of the photos that I took. Lemon, olio, nuevo sea salt. 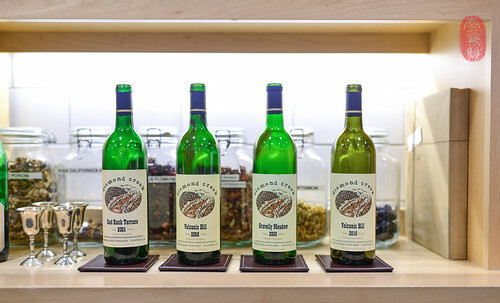 dried fruits, smoked pinecones, roasted chestnuts. Breads for this dinner provided by Tartine Bakery. 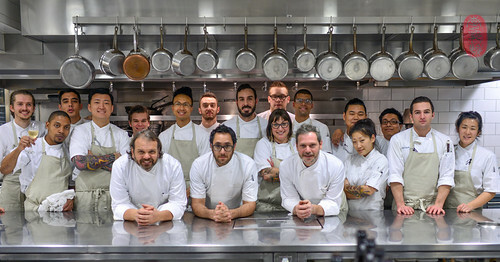 * Six degrees of gastronaut dining: by complete coincidence, Miles Pundsack-Poe, who is now a line cook at The Restaurant at Meadowood, was working in the kitchen at Asador Extebarri the day the Franks and I dined there. ~ by ulterior epicure on December 10, 2014.